The 8x50r Lebel, also known as the 8 x 51mmR, was quite unique when it was introduced. The 8mm French Lebel was adopted in 1886 and has the distinction of being the first smokeless powder round adopted by a military force. This was a mere two decades after the American Civil War, a war that still saw heavy use of single shot breech loaders. Frankly, the 8mm Lebel was the most advanced round of it’s time. The round served within France and her colonies for over fifty years, two world wars, and several colonial disputes. The 8mm Lebel is the name of two French rounds, one for rifles and the other for revolvers. The rounds are of course not interchangeable and often differentiated with rifle or revolver after the round’s name. 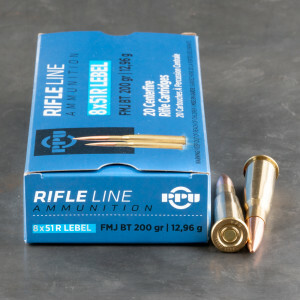 Excellent quality ammunition for Berthier and Lebel rifles.